Spring Cottage/Apt Spring 3 X 44.208. 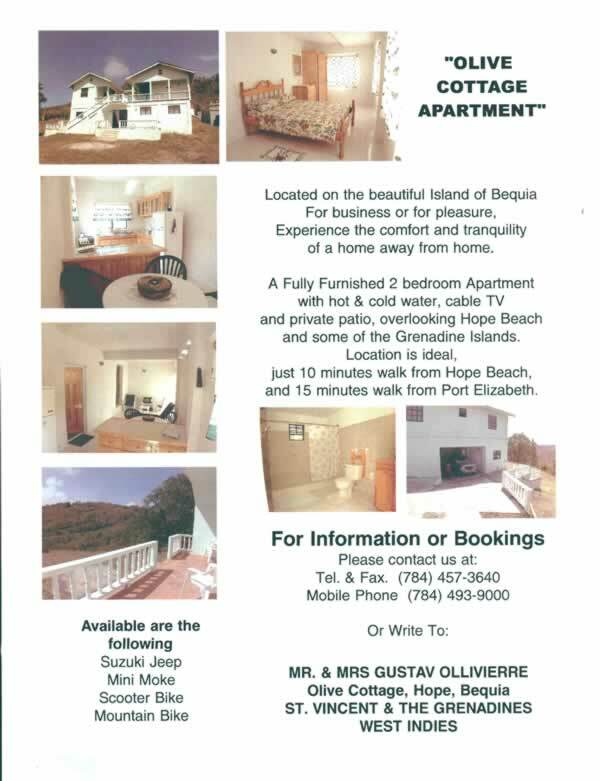 Apartments and guesthouses are a great way to experience Bequia. Most have an on site manager who can make recommendations and offer insights. On our small island nearly everyone has a view of the water, and many units are close enough to the sea for an easy morning dip before breakfast. Accommodations range from the small single apartment units to larger establishments with restaurants. Some have meal plans and others offer complete housekeeping set-ups. From the more remote, private units to the units nearer the centres of activity, there is something to suit almost everyone. What better way to get the feel of island living than one of Bequia's Apartments or Guesthouses. Contact the establishments below and tell them you saw them on Bequia Net. One and two bedroom cottage- apartments overlooking the harbor and centrally located near to dining, beaches and scuba dive shops. Free wireless Internet and metered A/C available to our guests. Come enjoy our views and hospitality. Reasonable rates and seasonal specials. Sweet Mango is a spacious two bedroom/2 bath suite located just a short walk to Lower Bay beach. Extra wide veranda supplies cooling breezes and breathtaking views. Numerous restaurants nearby. Walk to two different beaches.